Today I spotted shelves full of Essie Nailpolish for only $2.99 at Lot-Less on Chambers Street in downtown Manhattan (NYC). Essie brand nailpolish usually retails for $8 a bottle, so this discount is more than 60%... yay for saving moolah! If you're interested, hurry up and get them because they will probably go fast. What's your favorite nail-polish brand? 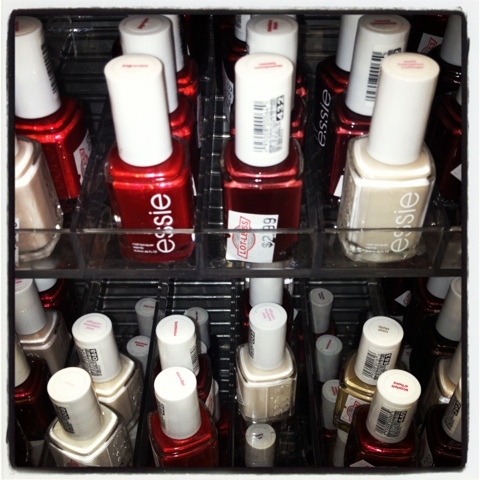 What colors are you lusting for this fall? Doing anything cool with your nails lately? Leave your comments below. p.s. checkout this post from the Bon Vivant and a Budget archives about why you should do your manicures and other cool stuff at home. hahaaaa wow that is insane... so many ways people can waste their money... thanks for sharing!